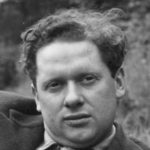 Dylan Thomas was a Welsh poet and writer whose works include the poems “Do not go gentle into that good night” and “And death shall have no dominion”; the ‘play for voices’ Under Milk Wood; and stories and radio broadcasts such as A Child’s Christmas in Wales and Portrait of the Artist as a Young Dog. He became widely popular in his lifetime and remained so after his premature death at the age of 39 in New York City. By then he had acquired a reputation, which he had encouraged, as a “roistering, drunken and doomed poet”. "My education was the liberty I had to read indiscriminately and all the time, with my eyes hanging out." "Though lovers be lost love shall not."